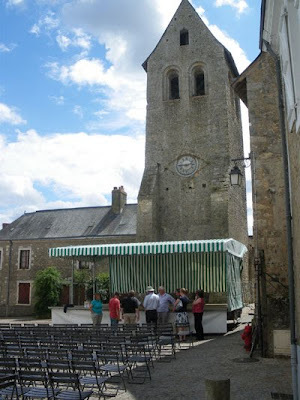 The two historic villages of Raglan in Monmouthshire and Parcé-sur-Sarthe, Pays de la Loire, have recently agreed to, an initially informal, twinning between the two villages. At a public meeting in late February 2009 residents of Raglan unanimously voted to twin with Parcé. Copies of the presentation can be viewed by clicking here. The meeting also featured a video introduction from the mayor of Parcé which is shown below. Raglan Twinning Association, in partnership with local hostorian Cheryl Morgan, is currently working on a guide to Raglan, due to be published in spring 2010. 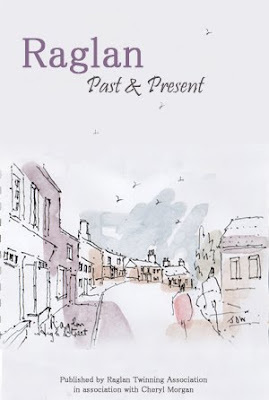 The booklet will provide a wealth of information on Raglan including its history and culture, details of annual events and information on the villages's clubs and societies. There will also be information about local walks from the village and profile of activities in Raglan. The guide will be distributed free of charge in both Raglan and Parce regions. Raglan has recently received its first official visit from representatives from Parce, including the Mayor and Deputy Mayor and their partners. An extremely successful trip the vistors all stayed with Raglan residents, visited Raglan School, Castle, Golf club as well as joined us for the French evening at the Beaufort and at other informal receptions. 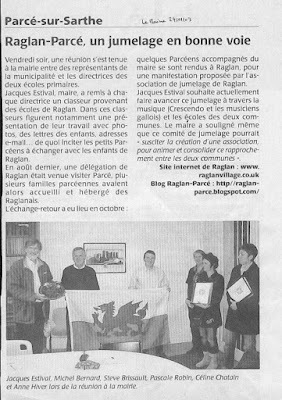 During the French themed evening the Mayor was presented with a ceremonial plaque from the people of Raglan. The Plaque will now reside in Parce's town hall. 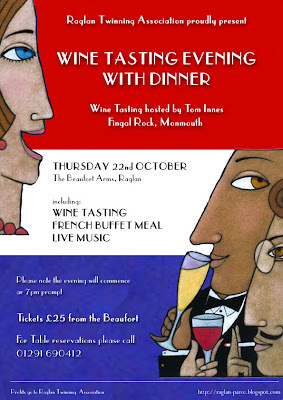 Don't miss our French evening on Thursday 22nd October at the Beaufort. The wine tasting will be hosted by local wine guru Tom Innes and is set to include many of your favourites from the Loire and Burgundy wine regions. A quality French buffet and live music will ensure we all have a great evening. Tickets will be available for purchase from the Beaufort at the beginning of September. Tables from four upwards can be reserved. Profits from the event will go to Raglan Twinning Association. 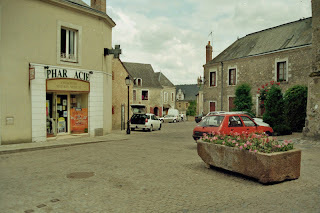 After a sleepless overnight ferry crossing and a largely uneventful drive down from Le Havre, Doug, Liz and I arrived for our first visit in Parcé-sur-Sarthe. 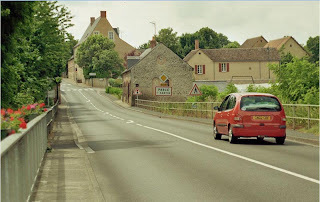 We had set out from Raglan in Doug’s van on the previous evening catching the overnight ferry from Portsmouth to Le Havre followed by a two and a half hour drive from the ferry port. As our jazz and blues quartet ‘Lounging About’ had been invited to play at the Parcé Music Festival that evening we had brought the PA and our instruments in addition to our baggage and assorted gifts for our hosts. Even squeezing a couple of baguettes in the back of the van would have been a challenge. In total thirteen of us (eleven from Raglan) were visiting Parcé and each group had selected different ways to travel including the Ferry to Cherbourg and driving via Dover. On our way to the village we had picked up Andrew and Anne Morton from Le Mans train station; they had caught the Eurostar via Paris. As we drove into Parcé our first impressions were extremely favourable – honey coloured medieval stone buildings on the side of a hill sloping down to a wide gently flowing river; glorious weather truly an idyllic setting. Our first destination was that of Stève Brissault, Parcé’s deputy mayor in charge of twinning. Stève had visited us in Raglan back in May and was the main co-ordinator for the trip. His farm was a mile or so outside Parcé on the road to Sable and housed some 17,000 chickens and ducks. As the poultry were all being shipped off the week of our visit it was busy time for Stève. After a restorative orange juice we all drove back into Parcé to meet up with Chris, Kathleen and Laura Butler-Donnelly who had arrived in Parcé earlier than day. Stève then distributed us to our various hosts who would be accommodating us during our stay. Doug, Liz and I were to be guests of Jacques and Anne-Marie Estival. Jacques has been the mayor of Parcé for the past couple of years. The couple own two fifteenth century properties on either side of the Rue Basse. Jacques kindly explained that one house would be ours for the duration of our stay - a 15th century four bedroom house by the side of the river with a garden full of fruit trees and a fridge stocked with beer. Andrew (AJ) and Joanne Johnson who had arrived the day before were housed with a family a couple of doors down the same street. Chris, Kathleen and Laura stayed with a local potter in the centre of the village and Anne and Andrew with a couple on the edge of the village. Our remaining Raglan visitors Tony, Ros and Elenid Rowlands had booked a gîtes just outside the village. As our immediate priority was the concert that evening we only retired to the bar for one drink before checking out the venue. 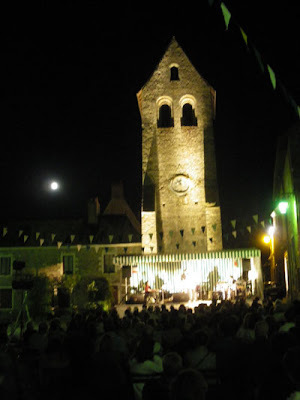 A wonderful canopied stage had been set up in the town square with a backdrop of the 11th century Bell tower. Chairs were neatly laid out with lights both for the stage and to illuminate the tower. We discovered that there were two groups performing ourselves and a Jazz quartet from Paris. We were scheduled to finish the evening playing from 11pm – a scary thought as we had had virtually no sleep and been travelling for the previous 12 hours. We unloaded the PA and set up our equipment. Before the concert commenced all the Raglan visitors, their hosts and various members of the council gathered for light meal at one of village bars. As we all tucked into our Croque’s Monsieur the bar’s outdoor tables resounded to a combination of French, English, Franglais and camera shutters as we all got to know each other. We learned that the other band performing were from Paris and were students at the world famous Didier Lockwood School of Jazz which scared the living daylights out of us rank amateurs. It also suddenly dawned on me that as Chairman of the Raglan Twinning Association I may be called upon to say a few words at the concert so I hastily scribbled a few words on a napkin and surreptitiously passed to Andrew for him to translate into French for me. 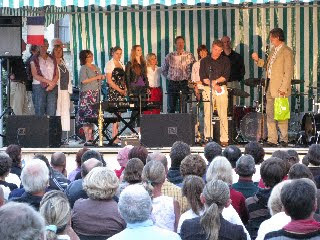 The mayor introduced the concert, welcomed the visitors from Raglan and called all thirteen of us on to the stage. He presented us with a plate decorated with the Parcé and Raglan logos and a decorative medal of the village. I said a few words of thanks in appalling French – whether anyone understood I know not but they seemed to go down well. The jazz band were all superb musicians and performed a selection of contemporary jazz and originals. We came on at about eleven and played for about forty five minutes before inviting the other band to join us on stage and end the evening with a jam session (or Boeuf as they call it in France). Everybody thoroughly enjoyed the event and after packing away the equipment we all retired to bed exhausted but elated. Doug, Liz and I had been invited to join Jacques and his wife for breakfast at their house opposite. An al fresco breakfast was followed by a quick look at our host’s thousand year old wine cellar full of dozens of cases of dusty bottles of vintage wines. Jacques is known to be a fine judge of wines. 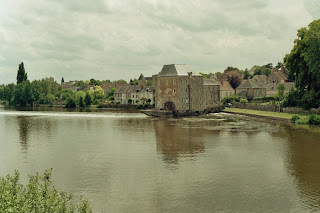 After saying our goodbyes to AJ and Joanne who had to return to the UK, the three of us set off for an appointment with Mme d’ Amecourt at her Chateau Pechesseul on the other side of river. In early discussions Raglan Scouts had expressed an interest in coming to Raglan and it was suggested that the grounds of the Chateau may be a convenient location. The Chateau, a private house not open to the public, was truly awe-inspiring set in an estate bordering the river and has one Italianate and one French facade. All was in excellent state of repair. Apparently the family own some of the largest and best vineyards in Bordeaux. Liz presented Mme d’Amecourt with a Raglan Scout neckerchief which she immediately put around her neck before giving us the guided tour of the facilities including the family chapel, an untouched Victorian laundry room and various outbuildings the Scouts would be welcome to use. It was explained that the camping would be ‘rustique’ and there were plenty of fallen trees if the scouts wanted to make their own tables, chairs and fires. She kindly said there would be no charge for the scouts to stay and would see if she could get some of the local scout groups to join the Raglan troop if they decided to visit. Returning to Parcé all the Raglan contingent joined up for a fantastic barbeque at the home of Michel and Blondine whose house was an antique shop in the centre of the village. Their large garden ran down to the river at the end of which was the plage – where the Parisians used to come to swim in Victorian times. The meal was superb laid out on long trestles with veal kebabs, pork rilletes, local wines and ciders and superb puddings. We handed out our Welsh flags to the local children and ended to lunch with recitations of French and Welsh national anthems with the mayor leading the singing of the French national anthem (forgetting many of the words). The previous night we had been introduced to John Hodgkinson a retired English naval commander who lived in Parcé three months a year. John had built his own steam launch which he had used to cruise up and down the river. Sadly he had had problems getting his paraffin fired boiler certified and had converted it to run on batteries. John kindly took half the party for a trip on the river and agreed a similar trip for the rest of party the next day. Those that did not join the boat trip caught up on a few hours sleep before being given a guided tour of the village by delightful young lady called Noel who had an excellent understanding of English and was very knowledgeable about the fascinating history of the village. A rather eccentric French maths teacher gatecrashed the tour and contributed to the light hearted banter. During the evening Doug Liz and I joined the Rowlands family for a light meal at their delightful gîtes just outside the village before taking a brief trip to Sable and Solemnes to see the illuminations. Meanwhile Anne and Andrew were treated to a gourmet meal by their hosts Jackie and Sylvie including many local delicacies and comprising,we understand, at least six different courses and assorted alcoholic beverages. After breakfast we joined up with Anne and Andrew set off to visit the nearby village of Asnières. A very pretty village whose Church of St Hillaire contains a collection of exceptional wall paintings from the 12th and 16th centuries. The village seemed to be a beacon for artists painting the beautiful scenes from the bridge. After purchasing some provisions from the village shops we headed to Solemnes famous for its Abbé and had a picnic lunch by the river with the Abbé in the background. It was fascinating to see the monks about their work driving tractors, painting gates and fences. Returning to the village Doug Liz and I joined Commander John on his launch and cruised a mile or two up river to another water mill – the wide gently flowing river is beautiful and we passed a number of fisherman and assorted pleasure craft cruising the river. We then all returned to Solemnes to partake in Vespers in the Abbé – a unique event as it was all sung in Gregorian chant by the monks of the Abbey. On returning to Parce we stopped off for a quick drink with Anne and Andrew’s host family before meeting up for a drink with Archie and Rosemary (an English couple living in the village who had first suggested Raglan as a potential twin village). In the evening we had decided to take our host families out for a meal and dined at the Auberge d’Acacia just outside the village. The mayor explained than he had not been to the Auberge for a couple of years – the last time he had been it had been run by and English couple and the food was awful. Now with new French owners the meal was excellent and we tucked into an excellent al fresco three course meal (worthy of any of Monmouthshire’s top restaurants). We then all retired to Jacques and Anne-Marie’s for a farewell drink of interesting liqueurs squirreled away in his cave. After a quick shopping trip in the village we all said our farewells and set off homeward. As we were dropping Anne and Andrew off at Le Mans so they could get the Eurostar home we decided to have a look around the old city and Cathedral. The huge Cathedral was an impressive sight – on a par with many of the UK’s greatest and the old city was a delight – full of medieval half timbered houses and interesting shops. Saying our farewells to Anne and Andrew we set off for Le Havre and were just about the join the motorway when Liz discovered Anne’s handbag in the van – so we had to return to Le Mans. Luckily we still made the ferry home returning to drizzling rain and autumnal temperatures. Over the next two months months Raglan will be welcoming its first visitors from Parcé including, on 16th/17th May, Steve Brissault who is in charge of Parcé's twinning programme and in June Parce's Mayor, Jacques Estival, is planning on visiting over the Festival weekend. Raglan Jazz and Blues band Lounging About have been invited to perform at Parcé's Jazz Festival on the 3rd August and there will be a number of visitors from Raglan for Parcé's village Fete later in August. Schools in both villages are looking to link up and plans are in place for potential visits from Raglan Scouts and Raglan Parc Golf club. Anyone wishing to go to Parce and camp may want to take advantage of a 10% discount available on all new tents bought from Raglan Camping and Kite Centre. Just mention "Raglan Twinning" when ordering.